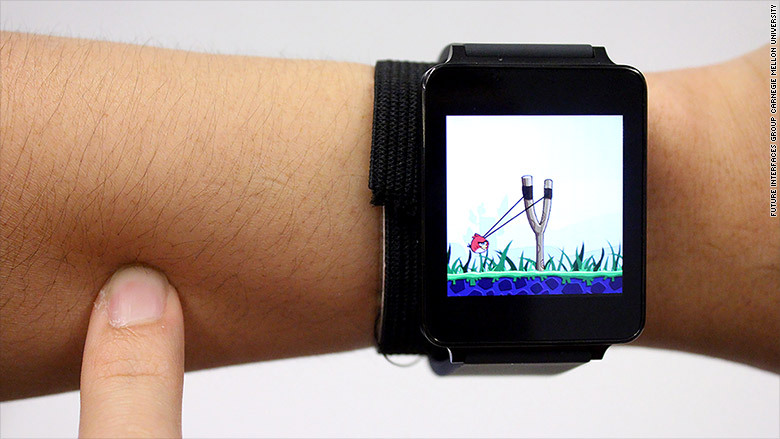 Is that smart watch screen too small for your fingers? You can make it bigger ... by turning your arm into a touchpad. Researchers at Future Interfaces Group at Carnegie Mellon University came up with a new technology that turns skin into a touch sensor. "Small wearable devices -- such as smartwatches and digital jewelry -- are fast becoming viable computing platforms ... however, their small size severely limits the user experience," the researchers wrote. The group wants to solve the tiny screen problem by extending it the skin. Their device, called Skintrack, has two components: a signal-emitting ring and a sensing wrist band. It uses electrodes placed in the band to track movements of the ring-wearing finger. When the finger touches the skin, it sends a high-frequency electrical signal into the user's arm. The device uses the human body as an electrical conduit. That might sound a bit scary, but it is safe and already used in other areas, including medical tech. As the finger moves around the skin, the system computes its position based on the distance from the electrodes. The technology works even through a layer of clothing. Skintrack recognizes all the usual touchscreen signals, including tapping, swiping, and spacial gestures. In the demo video, the researchers show how drawing "N" on a wrist launches a news app, while "S" puts an incoming call on silence. The researchers say that once users get the hang of it, the system can approach a touchscreen-like accuracy. "Our approach is compact, non-invasive, low-cost and low-powered," the group said. "We envision the technology being integrated into future smartwatches, supporting rich touch interactions beyond the confines of the small touchscreen."